The fourth annual Kootenai Valley Triathlon was held on Saturday, August 25. Starting and ending at the Libby Christian Church on Kootenai River Road, the run/walk-bike ride-paddling event took runners through J. Neils Park, over the Kootenai River on the old haul bridge, and back down 5th Street to Riverfront Park. At the park, participants climbed into kayaks and canoes, onto paddleboards, and even into a rubber boat or two, to paddle and float down the mighty Kootenai River to Bighorn Terrace at the end of River Road. With bikes waiting there, the athletes then pedaled back up River Road to the church. Along with organizers Beth Burns, Sharon Brossman, Jerad Lampton, and Bryce Huck, Warner helped create an event that is open to all ages and skill levels. Event participants were as young as ten and as old as their late 70’s. There is a walking option for those who prefer it , and folks can split into teams if they like. These options combined with the relatively short distances of a 5K run, (or 3K walk), 7 mile paddle, and 7.5 mile bike ride, make this event one of the most accessible triathlons around. “We had competitors from Canada, Alaska, Washington, and Idaho this year,” said Sharon Brossman, event coordinator. Any funds left over from paying for the cost of the event will be donated to David Thompson Search and Rescue, who provided the on-river security patrol for the event. Although turnout was affected by the smoky air and high temperatures, over 40 folks participated in this year’s event. Carol Lisle was the overall winner, Robert Stein was the top male competitor, and Richard and Lesli Harlicker and Tim Reigh won the team competition. Most of the prizes were provided by Bryce Huck of Bad Medicine Bike Shop across Hwy 37 from Libby Christian Church where lunch was provided after the event. 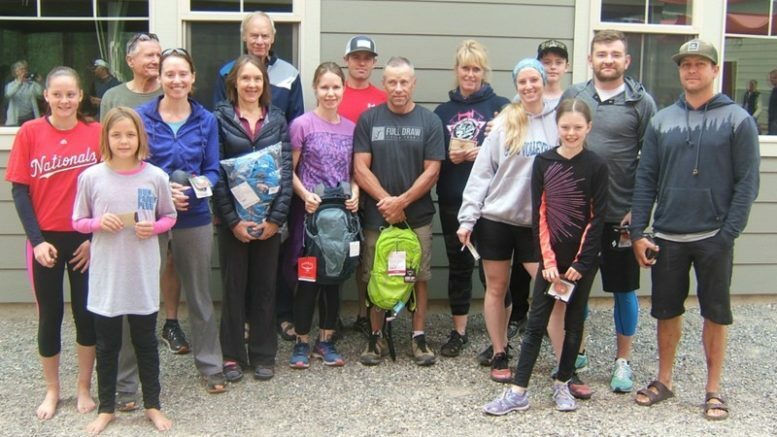 Winners of the Kootenai Valley Triathlon including: Carol Lisle- overall winner, Robert Stein -top male competitor, Denis Reisman- second male competitor, Travis Ager- top male runner, and team winners, Richard and Lesli Harlicker and Tim Reigh. Photo by Moira Blazi, The Montanian.